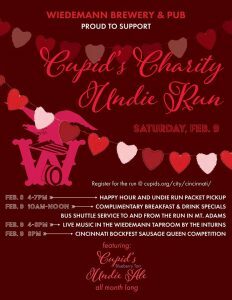 Friday: Packet Pickup and Happy Hour Sat, 10 am-noon: Complimentary Breakfast and Drink Specials Shuttle bus to Undie Run in Mt Adams Sat, 4-8 pm: Live music by The Inturns This February, be part of something great. Cupid’s Undie Run is a “brief” fun run that takes place in the middle of a BIG party. That’s right: party, run (a mile-ish, at your own pace), party – all to find a cure to neurofibromatosis, a genetic disorder that affects 1 in every 3,000 children born. We encourage undies, but we get that it’s not for everyone, maybe costumes are more your style? So whether you start a team with your friends, join a team, or run solo, just come out, have a blast, and raise some money for NF research!